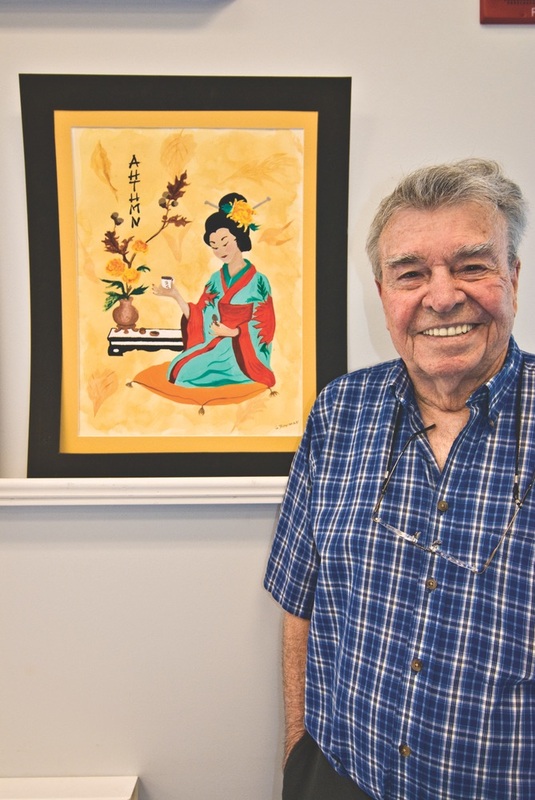 Each Monday from 12 to 3 p.m. at the Senior Center in Panama City Beach, a group of ten to thirty men and women—many of them retirees—settle at their tables, organize their art supplies, catch up with the news of the week, and share interesting perspectives on various art projects. Announcements and reminders are made by Jonita Haynes regarding upcoming workshops and special events. In 2002, Jonita (Jo to us) founded Painting Partners, an organization which provides members with a place to paint and exchange ideas. Until recently, she had served on the board of the Panama City Beach Senior Services Foundation as vice president. In the winter months, up to thirty people participate. Ten or more year-round residents hold down the fort during the summer. The room is electrified with activity as the members begin to paint, each one with a subject of his or her own. Gradually, a calm and Zen-like stillness pervades the room much like the silence at dusk that follows the sounds of singing birds as they prepare for sleep. But these birds are not asleep! They are seniors, snowbirds, retirees, and locals who are shattering the myth that the older adult is finished with the learning process. On the contrary, these people are among the most interesting, dynamic, and talented individuals I have ever known. They adhere to the philosophy that lifelong learning reaps benefits for the individual and the community. They enjoy learning new skills, maintaining a social network, and forming valuable relationships while sharing their gifts and knowledge as they volunteer in different ways. They also know that the aforementioned activities are important in order to keep one’s brain active and functioning, thereby helping them to lead happy and productive lives. It is estimated that approximately 800,000 temporary residents migrate to Florida from all over the Northeast, Midwest, and Canada. In particular, the Emerald Coast attracts snowbirds from the Midwest who love the weather and the beauty of the area. Many of the locals are also transplanted snowbirds. Businesses and hoteliers have long appreciated the value and impact of these people on the economy, and it is reasonable to deduce that restaurants, traffic patterns, and housing are all affected by the winter visitors. At the University of West Florida, the Haas Center for Business Research and Economic Development is the premier source for information about the Northwest Florida economy and its people. The people there were very helpful in terms of directing me to some studies which examine the economic consequences of retiree migration (Serow, 2003; House, 2006; Smith, 2006). Results indicate that more research on this subject is needed. The human brain consists of billions of neurons which connect with one another to process and transmit information for all physical and mental functioning. When a person discontinues an activity, the neural networks begin to fail. When one learns a new language or how to knit or how to play a musical instrument, new neural pathways are opened. Research suggests that seniors maintain good cognitive skills if they continue to use those pathways and those skills. In other words, USE IT OR LOSE IT! Painting Partners and Jonita Haynes help people to USE IT! Jonita, has been painting since she retired in 2002 from her job as the dean of the School of Education at Athens State University in North Alabama. “Painting uses a part of the brain that is both creative and expressive—it is also a contradiction of sorts in that it combines at the same time, both freedom and discipline; excitement and calm,” she said. “It is physically, emotionally, and spiritually satisfying.” She is a former professor and director of K–12 instruction in the Huntsville (Ala.) City Schools, a writer, the director of fund-raising at the Senior Center, and a proud mother and grandmother. Whew! Are you sure you are retired, Jo? Jo makes her home in Panama City Beach with her husband, Jim, a retired dean of the College of Business at Athens State University, where he taught economics. He is on the board of directors at the Panama City Beach Senior Services Foundation. Jo hones her painting skills by attending as many workshops as she can. Her inquiring mind and boundless enthusiasm bring all that she learns to the painting class as well as to organizing workshops and events. The quality of her artwork belies the fact that she is new to this endeavor. No one likes to grow old, but there is an upside. Finally free from the constraints of work and family responsibilities, one has the chance to rediscover beauty in the world and engage in new activities. Maybe, this winter, I will learn belly dancing! Webster’s Dictionary defines art as “the use of skill and imagination in the production of things of beauty.” In addition, painting provides a venue for one to learn a new skill or hobby and, through self-expression, a different way of looking at the world. Patricia Ives, from Sedalia, Missouri, concurs: “Painting is a real high when it works, and it is a way to look at the world.” Patricia has been painting for fifty years and has spent the past ten winters at Edgewater Beach Resort. Another fearless lifelong learner is Judy Wade, who taught high school English in Ontario. “I love the fact I am learning new things,” she expressed. Diana Scott, an elementary school teacher from Ontario, calls painting “great fun.” I love the intellectual curiosity common to teachers and the way they love to discover and continue to learn. Pat, a teacher from Michigan, is still learning. “Painting,” she said, “is a wonderful hobby, alone or with friends. Our world is incredible and the Gulf is incomparable!” Don’t you just love this sense of wonder and enthusiasm in this current negative climate? Another teacher from Michigan, Julie, has been painting for twenty years. Paula Clark believes the same: “Painting means friendship, camaraderie, enjoyment, and reward.” She began painting at Edgewater Beach Resort seven years ago. Although many of the participants are snowbirds, the dedicated year-round residents keep the class alive and ready for the others when they return each winter. Husband and wife team George and Pat Bowman are originally from Chicago and now live in Panama City Beach. George has been painting for thirty-five years and teaches workshops. His artwork reveals beauty, precision, and detail. Ruth Burwell, my friend and my daughter’s mother-in-law, divides her time between Seattle and the Gulf Coast. With an extraordinary portfolio and incredible talent, she has been painting since she was fourteen. 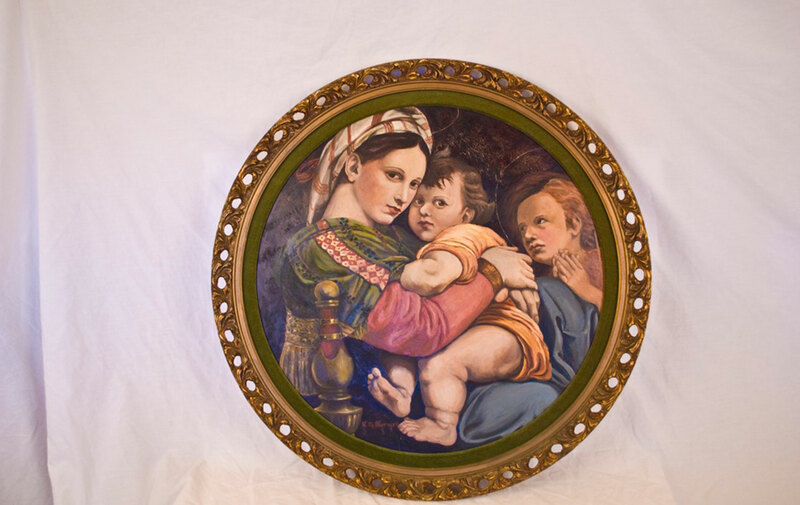 Her body of work includes portraits of Saudi kings, Middle Eastern life, and copies of the greats, such as Vermeer’s Girl with a Pearl Earring and Raphael’s Madonna of the Chair. Yours truly started to paint in 2005. It causes me to stretch my limits and it takes me out of my comfort zone. I now see the myriad patterns and shapes in nature and the colors of sea and sky in a whole new way. This is only a sampling of the many participants in the art class who have a plethora of experience and who have enriched my life. 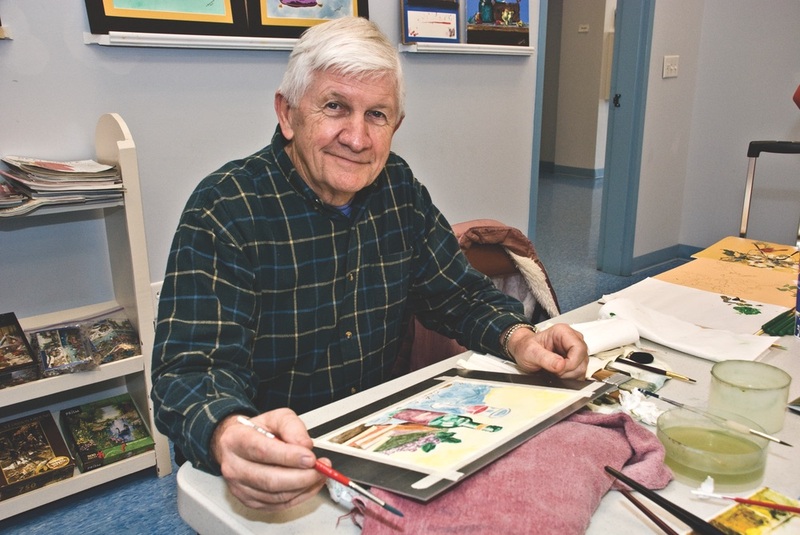 Painting Partners is only one of the many activities and programs at the Senior Center. Among the others are yoga, belly dancing, computer classes, golf, bridge, ballroom dancing, health seminars, and woodworking. The Senior Center, on Lyndell Lane, provides services and programs for seniors within a three-building complex—Lyndell Community Center, Cypress House, and the Oatfield Center. The Panama City Beach Senior Services Foundation was formed in May, 2003 for the sole purpose of facilitating the further development of facilities and programs at the Senior Center. It is classified as a 501(c)(3) nonprofit organization, and all donations are tax deductible. In March, 2006, the 8,000-square-foot Oatfield building was opened as a result of efforts of the Fund Committee, which secured contributions of dollars, materials, and labor from this generous community. The main benefactor to the Center is the City of Panama City Beach, which provides the major portion of the operating funds. Among the many benefactors are the St. Joe Community Foundation and the Hilton Family Foundation. Other sources are from individual donations, Center memberships, fund-raisers, businesses, and workshops. At present, there are approximately 600 members, including year-round residents and snowbirds. To support the Senior Center, you can donate, volunteer, participate, and/or join the Century Club by making a yearly contribution of $100. The Oatfield Building is also available to rent for reunions, weddings, and special events. For availability and pricing, contact the Oatfield Building at (850) 233-5065. Marie Ryan is a retired school nurse from Massachusetts. Since 1993, she and her husband, John, have frequented Northwest Florida where they have loving family members. With an avid thirst for the arts, Marie enjoys painting, writing, and knitting. Her image was featured on the cover of VIE’s Summer 2009 issue.